As everyone saw, Betty White underwent her pop culture apotheosis Saturday Night when she served as host of Saturday Night Live. No doubt Lorne Michaels thought this was a good idea, but the first mover in Ms. White’s ascent was a Facebook campaign. Well, that and a Snickers ad (eyes right). It’s up to the Chief Culture Officer to decide what Betty White tells us about the state of contemporary culture. One possibility is that she signals a willingness to rethink the way we portray people of age. Paul Thomas Anderson, the film director, seemed to me to signal the possibility of a change. The Dos Equis "most interesting man in the world" spot might (I repeat might) be more data on point. Modernista did an ad for Cadillac a couple of years that could also qualify. Well, there are lots of possibilities. I leave these to you. The point of this post is to get a clearer idea of who Betty White is as a cultural artifact. Before we figure out the significance of Betty’s SNL appearance, that is to say, we need to know the significance of Betty White. And that’s your CCO assignment. I suggest we scrutinize Betty White by contrasting her to another star. For your own purposes, you may choose any comparison that suits your fancy: Julia Louis-Dreyfus, Kim Kardashian, or Diane Sawyer. But for this assignment, the comparison is Betty White and Karen Black. The assignment: Compare and contrast Betty White and Karen Black. Use point form. No more than 500 words. Scale up from the descriptive differences to the cultural ones. Submit to grant27ATgmail.com in the next week or so. The prize: $100, a copy of Chief Culture Officer, and a VOWEL award. (The last stands for the Account Planner, Anthropologist, Ethnographer, Insight and Observation Award [AEIOU]) (This award is highly coveted and immediately take a job application to the top of the heap.) You will also get a place on the VOWEL Winner Hall of Fame on the CCO Ning network. Previous winners: Juri Saar, Reiko Waisglass, and Brent Shelkey. You may pick up your pencils…now! 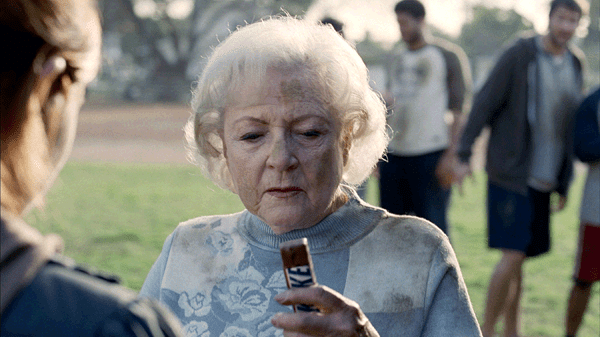 Betty White Snickers’ Ad here. Stevenson, Seth. 2009. The Most Interesting Man in the World: The star of Dos Equis’ New Ad Campaign is Too Cool to Shill Beer. Slate. May 25. here. Carole Walker, head of integrated marketing communication at Mars. This entry was posted in Uncategorized and tagged BBDO, Betty White, Brent Shelkey, Cadillac, Carole Walker, CCO, Chief Culture Officer, Diane Sawyer, Dos Equis, Julia Louis-Dreyfus, Juri Saar, Karen Black, Kim Kardashian, Lorne Michaels, Mars, Modernista, Paul Thomas Anderson, Reiko Waisglass, seth stevenson, Snickers, SNL, VOWEL award on May 11, 2010 by Grant. I’ve been thinking about Betty White’s resurgence, and I think there are a few other factors that played a role as well that built up to her really rising back to the top of our pop culture consciousness. Perhaps the groundwork was laid a bit with her role as Catherine Piper on Boston Legal (2005 to 2008). Simultaneous to that was multiple runs in a surprising, more dramatic role as Ann Douglas on The Bold and the Beautiful from 2006 until 2009. (She did more than 20 episodes as that character.) And then there was a particularly campy performance in “The Proposal” last year, as well as a 2007 TV Land Awards parody of Ugly Betty that landed White on the Ugly Betty show itself in a guest appearance. So, well before Snickers and the SNL campaign, it seems there were clues laid in various sectors of our popular consciousness that there was something appealing about this once Golden Girl embracing her age. Maybe there’s a tie-in here as well to Johnny Cash’s late resurgance, again where he embraced rather than eschewed the toll time had taken.